Since the eighties DC and Marvel have used line wide events to boost their sales and bring in new readers. And in the modern comics world there is definitely no shortage of events. In fact it seems like the big two have a new event happening every other month. And the truth is most of them aren’t very good. But I want to focus on the events that have truly worked, and had a lasting effect on the books in the aftermath of the event. But keep in mind these are events that worked for me, and I fully understand that mileage may vary. Going into this event the continuity of the DC universe was a mess. There were characters that had major inconsistencies whether it be the power set of Superman or the age of a characters that had been around for upwards of fifty years and hadn’t aged a day. Sure, these are problems that occur in comics on a regular basis. But it was getting exceptionally bad. So the higher ups at DC put together a 12 issue event to simplify and retcon everything. I have not read this event personally but the effects of Crisis lasted for years. And it is often credited as being one of, if not the best event ever put together. 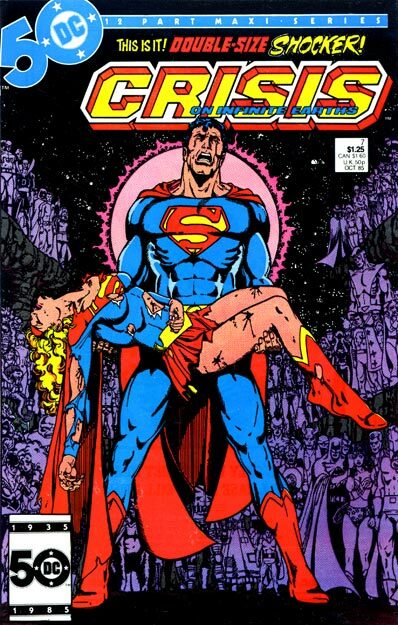 Some of the biggest events that occurred in Crisis were Barry Allen sacrificing his life to save the universe and the death of Kara El. The latter of which made for one of the most iconic covers. Superman holding the dead body of his cousin while he screams to the heavens in sadness. Whether it was actually the best or not is subject to debate, but you can’t argue that it was the catalyst for all of the events that came after it. House of M is one of the best Marvel events that I have read myself. The story revolves around Wanda Maximoff suffering from a mental break and rebuilding reality to bring back her dead children and her marriage with The Vision. The problem is when she makes the alteration, it affects the entire universe around her. And her alterations are so deep that none of the former heroes even remember who and what they used to be. The only person that remembers is a small girl named Layla Miller. What made this event so great to me was the chance to see what could have been for some of the greatest heroes. For example in the new world that Wanda creates Peter Parker is a professional wrestler who is married to Gwen Stacy and they have kids. And mutants as a race are living in peace with the rest of mankind due to Magneto and his family ruling over both races as the royal family. So it makes you wonder. Why anyone would want the old world back even if they could remember it? There is a worldwide peace. So as Layla starts to spread her knowledge and they slowly start to remember who they really are the reader gets to see characters who have suffered for years with the death of loved ones and other pains, have to make the decision if they want their old world back. But could they forget the truth now even if they want to? And this event also ended with Wanda in the height of her mental break uttering the phrase “No More Mutants”. And with those three words she depowers most of the mutant population and stops any new mutants from being born for a long time. Of course the fact that it was written by Brian Michael Bendis, with art by one of my favorite artists Olivier Coipel, definitely added to my enjoyment of this series. 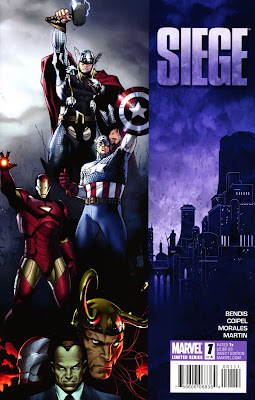 In 2010 Marvel was in the middle of Dark Reign. Norman Osborn was the head of H.A.M.M.E.R, which was his version of S.H.I.E.L.D. He was running two evil versions of famous teams in the Dark Avengers and the Dark X-Men, as well as running the Thunderbolts who were his own personal hit squad. All of the major heroes were either in hiding or leading small teams against Osborn’s administration. But Norman Osborn wasn’t content with ruling only earth, he wanted everything. So with the support of his fellow Kabal member Loki, Norman staged a very public battle with Volstagg that caused a lot of damage. The resulting backlash gave him fuel to lead his teams and army against Asgard. Which was a floating city over Broxton, Oklahoma at the time. But it really appeared that Osborn’s eyes were bigger than his stomach on this one. He also didn’t account for the instabilities of The Sentry leading to the death of another one of the Dark Avengers. Because when Sentry snaps and gives into his alter ego The Void there is nothing anyone can do about it. But Loki makes the ultimate sacrifice in an attempt to put an end to Sentry’s crazed rampage. A choice that brings about Kid Loki later in comics. 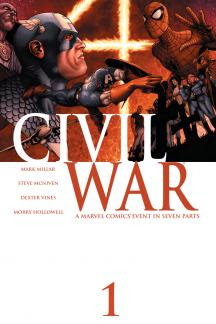 There was a lot happening in America when Marvel released Civil War. And the event was designed to be an analogy for everything that was going on at the time. Civil War focused on the government starting the Superhuman Registration Act which required anybody with powers to reveal their true identity and what they can do with their powers. Tony Stark and Reed Richards are firmly on the side of the Registration Act. Where Captain America goes against the government to protect the rights of the American people. What followed split the Marvel Universe down the middle. Civil War is very much an event for it’s time. I don’t know whether it would read the same for a person who didn’t live through the state of the world that Civil War was making a statement against. But the consequences of Civil War were felt for years to follow. But these are just the events that worked for me. And there are no shortage of events in comics so I look forward to hearing what events you really enjoyed. Thank you for reading my article. If you have any questions, comments, or suggestions. Please leave them in the comments section. And as always… Keep Reading Comic Fans!! !